* Develop strong practice and performance confidence. * Focus on what’s most important in practice and performance. * Beginners or Pro, we all deal with our own limits. * Deal with distractions and doubts. * Identify your own mistakes during performing. * Improve your performances and the communication of your song to your audience. * Manage “hostile” possible situations in different places. * Organize appropriate and effective concerts. * Use effective pre-performance routines to build confidence. * Devise effective and efficient practice plans. 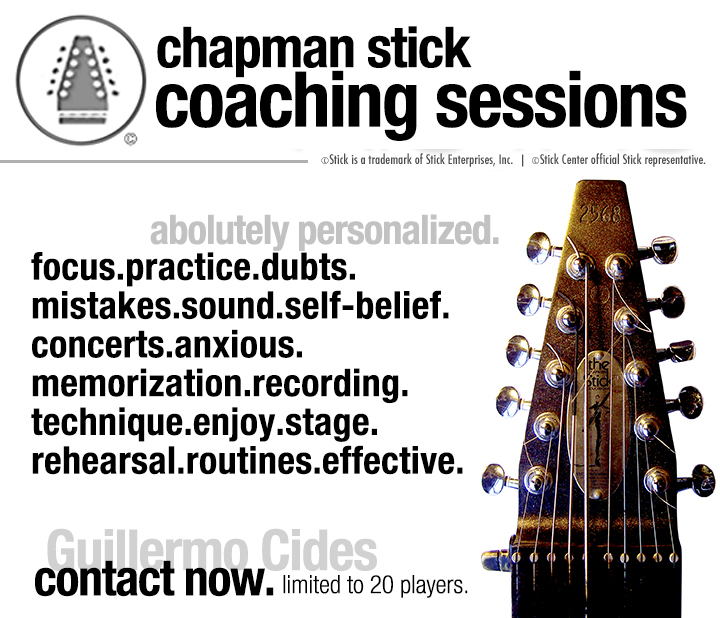 * Optimize your performance as well in concerts, auditions or other situations as you do in practice. * Enjoy your time performing well in front of others. * Work with anxiety or fear when performing. * Work with improvisation and enjoy it on stage. * Enjoy making mistakes and work with them. * Work with your own songs and get the greatest possible emotional experience from them. * Optimize your soundcheck time for a good performance. * Memorization system: hard and easy parts of a song. * Optimize the musical energy during a concert. * Improve the use of effects. * Prepare your songs for a possible album recording (advanced coaching). My coaching can include lesson techniques but it attempts to go far beyond what you get from usual lessons. My aim is to defeat the barriers you are having that are stopping you from improving in the way you want. It is personal work and every musician is different from another. My work is to understand you and help to improve your own musical potential. My background knowledge is my own experience of more than 20 years playing Stick concerts in many different situations including in bands, solo concerts, tours and recordings.